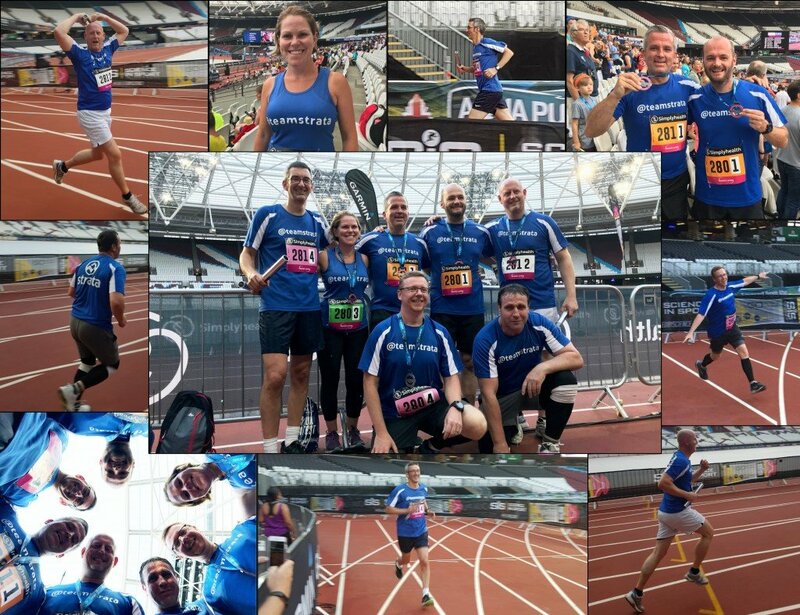 A massive well done to our Strata Squad for once again taking part in Simply Health’s Great Team Relay this year! The 4 x 5k relay race took place on Wednesday 4th July 2018 at London’s iconic Queen Elizabeth Olympic Stadium in East London. Strata Construction Group entered two groups into this fantastic team building event, with over 430 teams from businesses across the UK taking part in total. There was a real buzz in the stadium as participants prepared themselves, no doubt excited at the prospect of running the 2012 Olympic track. With the crowd cheering and the in-stadium entertainment to spur them on, both teams worked hard to complete the course, finishing in 155th and 332nd positions – An improvement on our previous 2016 results! We are so proud of them for tackling a challenging route in very humid conditions. Congratulations Ant, Denise, Marc, Dan, Jamie, Mark and Johnny!